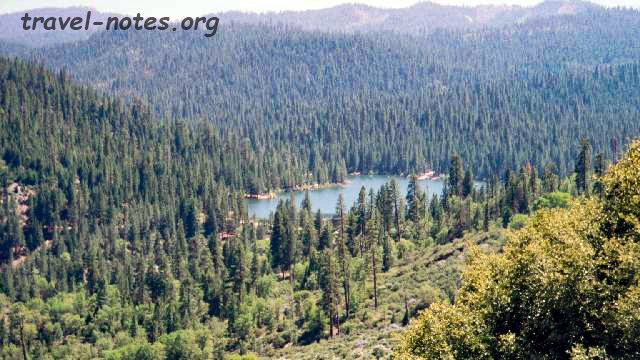 The twin national parks of Sequoia and the Kings Canyon is situated about 4.5 hrs South-East of the city of San Jose. A trip to this place should not be scheduled in winter if you would like to visit both the parks as the Kings canyon section is closed during that time. After seeing both the parks, I would say that you wouldn't be missing much by going there during that time. The Kings Canyon section does not have many should-not-be-missed-in-your-lifetime places. The best view that one can get is the view of the Hume Lake from the top of a mountain. It is a very pretty lake and the hike down to the lake would offer you some pretty sights. 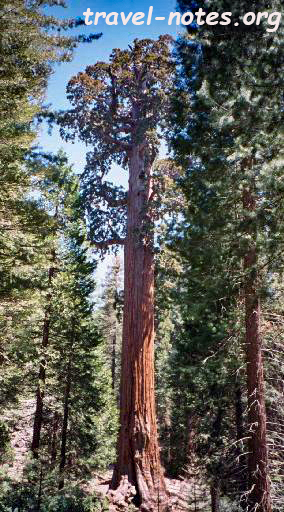 Sequoia National Park houses the largest trees in the world, the Sequoias : named after the Indian Chief who created the first alphabet for the Cherokee Indians. 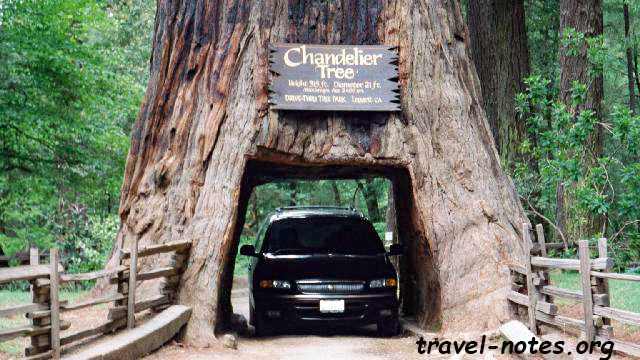 There are trees around the world which are taller or which are fatter than the giant sequoias found here. But these sequoias hold the Guinness record for being the largest by volume. The largest tree of the area, General Sherman, is in fact the largest living being on earth. It is about 84m tall and has a circumference of 31m at the base. This 2500 year old tree has a trunk volume of nearly 1,500 cu. m. The third largest tree, General Grant tree, is also known as the Nation's Christmas tree as it was born at about the same time as Jesus of Nazareth. The sequoia forests contrary to the popular belief doesn't have the drive through trees, although you can drive through a fallen sequoia. 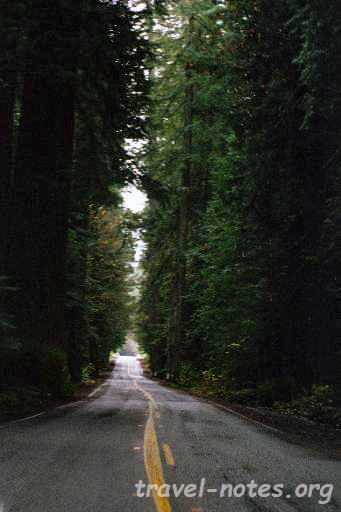 The drive through trees are found in the redwood forests about 600 miles north of this place. Apart from these giants, the place also offers excellent views of the valley from the various points on the main road and sunsets here are very pretty. One of the best points to enjoy the sunset is up the Moro Rock - a good 350 steps climb would bring you to the top a rock from where you can get a birds eye view of the park. This national park is a very good weekend destination. There aren't many places around the world where you can walk upright through the length of a fallen tree! 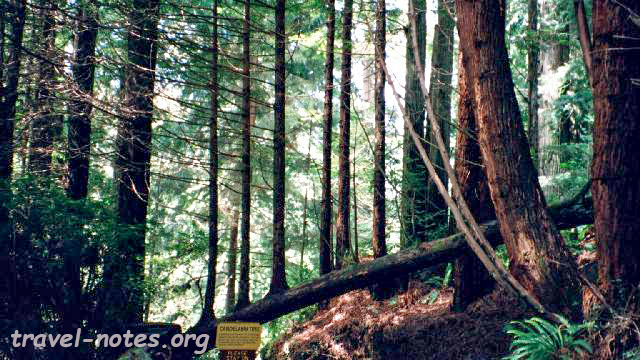 Redwood forests located 6 hours north of the city of San Francisco close to the Oregon border, is predominantly a collection of state parks. The drive to redwoods from San Francisco (on US101 or US1) is very scenic and takes you through the vineyards of Napa and some pretty beaches of Northern California. The prime attraction of this place is a 31 mile drive called the Avenue of Giants, which as the name suggests takes you through the heart of giant redwoods. There are three drive through trees in this area one of which is located along this drive. There are many trails available along this avenue where you can park your vehicle and take a light stroll. Two things which you would never miss in this area are spotting a tree house and a tree calendar. There is a tree house present at almost every milestone and a tree-calender next to every other tree house or a drive-through. The tree-calender, which uses the rings of the giant redwoods as the unit of time measurement, dates events starting from the crowning of Charlemagne to the World Wars. Apart from the avenue of giants, another recommended drive is a coastal drive taking you along the pacific ocean, from where, if you are lucky, you might be able to spot some whales. People also frequent a place called "Trees of Mystery" mainly to see some peculiar tree formations such as the Candelabra tree which has a dozen redwoods growing from a single fallen branch. People also come to this place to get married. Half a dozen redwoods have grown in the form of a Cathedral which has allowed the authorities to commercially exploit it by renting it out for marriage ceremonies! There are also many hiking trails available in the area, pick of them being a day long hike to the tallest tree in the world. 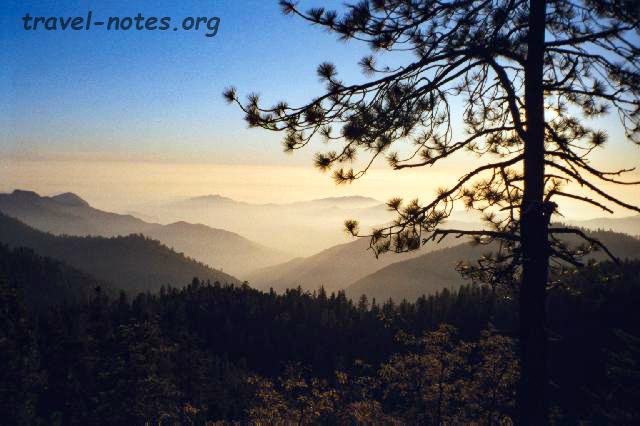 Click here for more photos from Sequoia and Redwoods NP.